Nkisi House at Mbad Museum and Dabls' African Bead Gallery. Mural of beads with mirrors reflecting trees at Dabls' African Bead Gallery. One of the exhibits at the Mbad/ABA Museum on Grand River Avenue in Detroit. An installation entitled "Iron Teaching Rocks Table Manners." Part of the mural at Dabls' African Bead Museum. You can hear the story here. 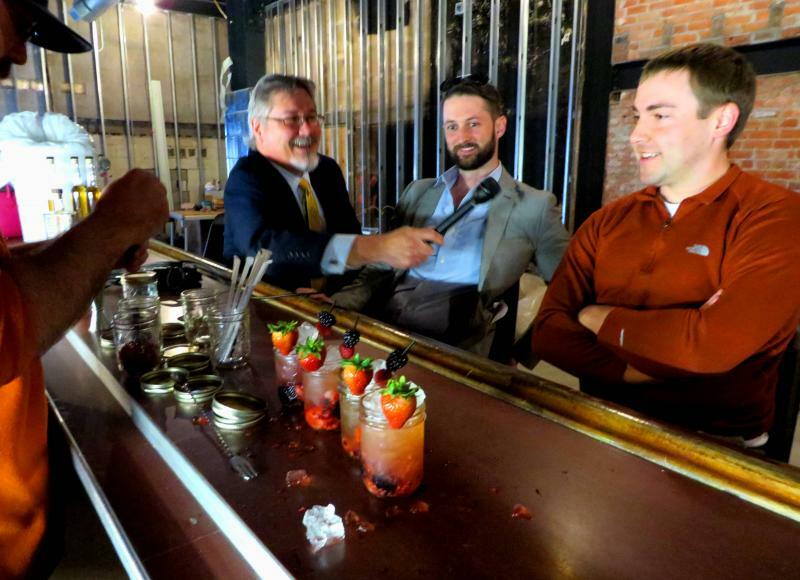 It seems every new restaurant, bar, or national retail chain opening in Detroit generates excitement in the wake of the city’s bankruptcy. Most are owned or operated by white people. But Detroit has many black-owned businesses that survived the worst of the city’s struggles. One of them has even become something of a landmark in the city. Driving the length of Grand River Avenue in Detroit is an experience in itself. It’s a mix of mega-churches, schools, abandoned buildings, some of the most interesting murals and graffiti you’ll find anywhere. And then there’s a block that catches your eye and is hard to explain. It’s been around 14 years and it’s the brainchild of Olayami Dabls. Olaymi Dabls is the entrepreneur and artist behind Mbad/ABA African Bead Museum. The Mbad/Dabls African Bead Museum is spread across two buildings, with a number of art installations in a grassy field that seem to defy reason. So why all this Africa-themed art here? It came down to economics. “I had a bead gallery, downtown Detroit. Moved here in 1994. Started trying to sell beads here and open and African bead museum,” Dabls explained. But it was tough economic times. Beads weren’t selling. Dabls decided he couldn’t worry about things he couldn’t change and instead started working on art installations in the open field behind the business. The art is wood, mirrors, steel, vibrant paint colors, and rock. It’s intentionally primitive, a departure for a man trained in precision work. I noted there was a lot of chaos in his work. “Yeah. Chaos is good. You need something to get the attention of the viewer. And if it’s too structured, they can be bored real quick,” he responded. Dabls says he wanted to tell the story of the energy between Africans and Europeans for the last 500 years in America in a way that doesn’t blame people for our history. One installation is a pile of twisted metal in the center surrounded by folding chairs, classroom-style. In each chair is a chunk of concrete with an abstract black silhouette of a head. The largest of the art projects is a two-story building. It’s called the Nkisi House, with symbols from some central-African cultures. It’s believed Nkisi is an object which holds spiritual powers. Dabl says he asked for three protections from the Nkisi House. Even during Detroit’s crackdowns on mural art and graffiti art, the Mbad Museum and Dabls’ African Bead Gallery have survived. They just might be a symbol of African-American entrepreneurs and residents who have lived through some of Detroit’s worst days, and hope to share in the city’s new prosperity. A popular Detroit art installation was destroyed by fire this morning. The Obstruction of Justice House was part of the Heidelberg Project on Detroit's east side. It was created by artist Tyree Guyton. He used discarded items and paint to transform two city blocks into an eclectic and sometimes controversial art exhibit. Guyton's wife, Jenenne Whitfield, describes,"You turn down the street, and there's this explosion of color: The trees, the sidewalks, the vacant lots. All had been turned into a giant landscape, a work of art that is literally known around the world." The City of Detroit might be going through bankruptcy, but the commerce of Detroit is growing in some areas. A new business that will open this summer is the latest in a fast-growing trend. Tucked away in the Eastern Market on Riopelle Street is a nondescript building. Go through the squeaky, jail-like door and you'll see one of Michigan’s newest whiskey, gin, and vodka distillers, the Detroit City Distillery. Right now, though, it’s mostly a dusty construction site. There are no whiskey barrels here- yet. They’re stored at a licensed facility. There’s no copper pot still- yet. It’s being manufactured in Germany right now. But they do have a classic wooden bar. Michael Forsyth and his partners found it in a vacant storefront in downtown Detroit and bought it. 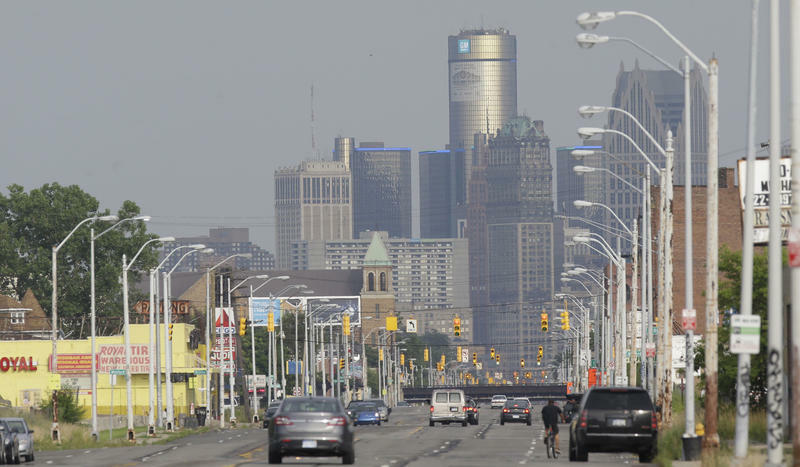 Few Detroiters think the largest municipal bankruptcy in U.S. history is great news. But plenty see it as an opportunity. Many Detroit business owners hope the bankruptcy will mean more stability and certainty, in a city that has had little of either in recent years. Sandy Baruah, head of the Detroit Regional Chamber, says the bankruptcy filing did not come as a surprise to him, nor should it surprise anybody else.